Properties in Hassleholm Central Station average 4.2 out of 5 stars. Cottage with stunning lake views! Property 2: Cottage with stunning lake views! A 1800's village where you live in the middle of the forest among Rådjur and Älgar. Property 3: A 1800's village where you live in the middle of the forest among Rådjur and Älgar. Scenic cottages located in northern Skåne. Property 10: Scenic cottages located in northern Skåne. 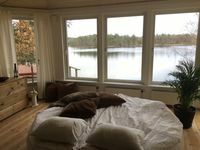 Accommodation with stunning lake views! Property 19: Accommodation with stunning lake views! Amazing views, cozy space, very nice host! Loved the sauna and nearby woodland hikes. Had a wonderful stay. It was so nice to have the family all together for Christmas under one roof!